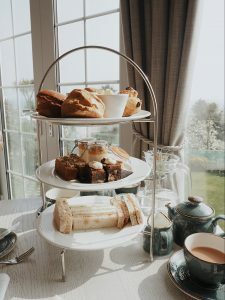 When it comes to Mothers Day, there’s nothing better than treating your loved one to some afternoon tea. 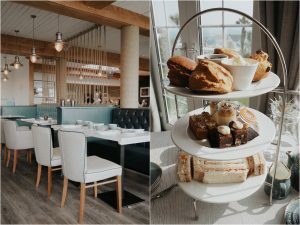 The epitome of luxurious girls lunch, I wanted to treat my Mum this Mothers Day and I went for St Michaels Resort & Spa in Falmouth. I’d never been before but I had seen some photographs online and knew it would be a lovely place to go and treat ourselves. 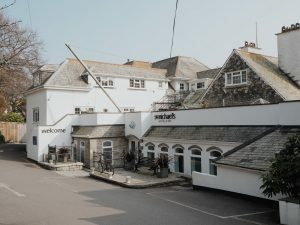 Set on Gyllyngvase road, St Michaels Resort & Spa is moment away from the wonderful Gyllyngvase beach in Falmouth. Perched upon the hill, you have great views across the beach, watching the waves roll in. We arrived at the resort and was able to park on the roadside, making it super easy and accessible. We headed down to the beach for a quick stroll before heading up to wait in the lounge for our tea to be ready. St Michaels Resort has a very welcoming, nautical yet warm vibe. 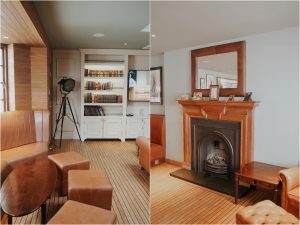 It was a little windy outside so we headed in and was approached by the friendly staff to take a seat in the lounges to relax before our tea at 3pm. There’s an abundance of spots to sit in the resort, with comfy sofas and seating to pass the time. I could happily sit here for hours just taking in the atmosphere. 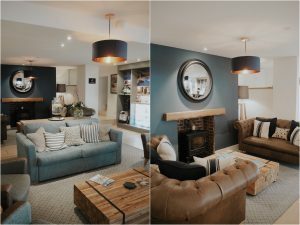 Around the corner we spotted a little nook which had comfy seating, a fireplace and a big telly playing Friends. What better way to relax than watching Friends on the big screen, hey? There were boardgames and books to read to keep you entertained. Once it was time, we were taken to our seat for our afternoon tea. We were very lucky and got a beautiful window seat overlooking the gardens and the beach. We were served tea of our choice and shortly later our food arrived. It all looks so pretty together, a classic selection of sandwiches, cakes and scones. We had two cucumber sandwiches, two egg mayonnaise sandwiches, two ham and chutney and two salmon. Desserts were lemon posset (so good, this was my fave! ), carrot cake, chocolate brownie and a chocolate tart. Topped of course, by four scones, two plain and two sultana. They were warm and perfectly homemade and the jam was delicious. Don’t forget to spread the jam first the Cornish way! The afternoon tea was 16.50 per person, a reasonable price against competitors. I had a lovely time in St Michaels Resort and so did my Mum. It was a beautiful resort and the staff and food were faultless. We have already planned to return to use their fantastic hydrothermal pool and I am so excited as we could see the outside hot tub and sauna from lunch and it looked so good! 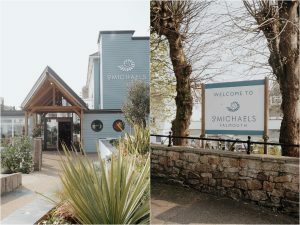 Book St Michaels Resort here and find their Instagram here. "Why I Stopped Following Big Influencers"